The judges nominate candidates for the Innovation Award based on who impressed during the presentations. Ultimately, it was the Centrica entry that impressed most. 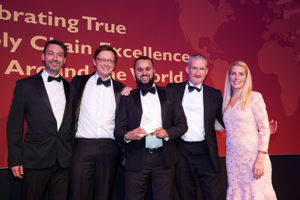 From left to right: Nairn Foster, Sales Director at Akabo Media, David Harper, Account Manager, Unipart Logistics, Mubeen Hafeji, Procurement Manager, Centrica, Andy Draycott, Head of Digital Transformation, Unipart Logistics, and Sara Pascoe. The winner in this category demonstrates how effective procurement and strategic sourcing strategies and supplier collaboration can deliver tangible business success through external market solutions. The project was fundamentally supported by strategic collaboration and a new partnership with Unipart Logistics. This has supported the Centrica business to deliver a Supply Chain proposition founded on innovation and industry best practice in a traditionally risk averse FTSE 100 company. It has enabled the Centrica business to achieve sustainable annual commercial savings. It has also unlocked an abundance of technical knowledge to benefit the end consumer and drive operational excellence. The Award for Innovation goes to Centrica with Unipart Logistics.